Jean short season is almost here — do you know what kind you’ll be slipping into? If not, we’ve put together a guide aimed at ensuring you buy the best pair for your body type, whether you’re tall, petite, curvy or something in between. If you’ve got curves, we say show them off. But when it comes to shorts, you’ll want to choose a style that flatters your hourglass shape — and doesn’t add more bulk where you don’t want it. Choose a mid-rise style that isn’t too tight and look for something with pleats and a belted waistband to highlight your best assets. Tuck in a fitted tank in a bold hue, add some pointed toe flats and an envelope clutch for an afternoon date or early evening patio party. 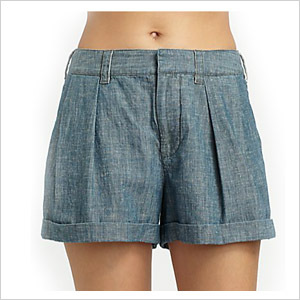 Our pick: Enhance your covet-worthy curves with a pair of casual yet chic Marc by Marc Jacobs pleated shorts (saksfifithavenue.com, $186). 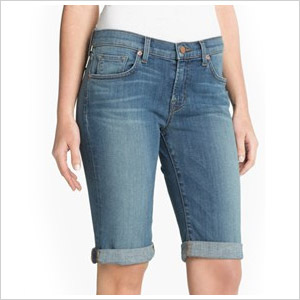 Finding jean shorts can be a frustrating feat for those of us who are petite. A style that works great on someone taller just ends up looking silly on someone with shorter legs. Find a fashion balance by looking for a pair of denim shorts with a higher rise (aim for 9″). This will help create a more proportioned look. Add a loose-fitting scoop neck tee and a pair of wedge espadrille sandals to complete the look. 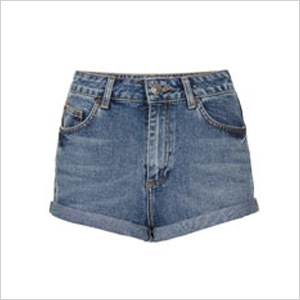 Our pick: Add the illusion of extra height with the help of these Topshop vintage high-waisted shorts (topshop.com, $56). If you were blessed with long legs, you can get away with shorts that have a longer inseam. Opting for longer walking-style shorts will accentuate your get-noticed gams. Pair your longer jean shorts with platform sandals in a neutral hue and a fitted tee in a polka dot or floral pattern. Our pick: Show off your long legs in a pair of J Brand cuffed stretch denim shorts (nordstrom.com, $198). No curves? No problem. You can still find a pair of denim shorts this summer that will flatter and enhance your natural shape. Look for a softer material with a looser look like summer-ready chambray. If you can find a pair with flap pockets in the back, even better — that will help give the illusion of curves. 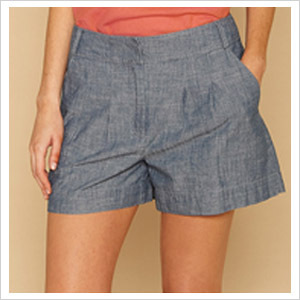 Our pick: Loose yet elegant chambray shorts perfect for any summer occasion (us.monsoon.co.uk, $50).